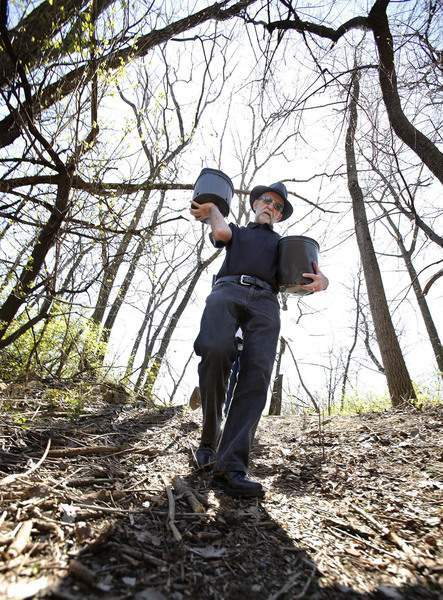 Chad Ryan | The Journal Gazette John Fabini carries conatiners of mulch to put down around new tree plantings as volunteers clean up garbage and plant trees along the bank of the Maumee River east of the Anthony Blvd. bridge on Sunday as part of Save Maumee's Earth Day project. 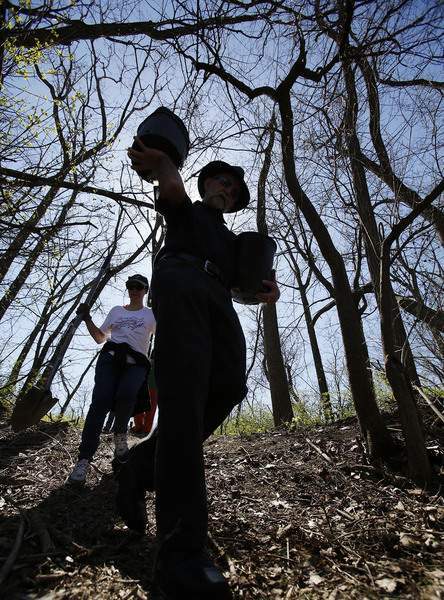 Chad Ryan | The Journal Gazette Nicole Harris looks for trash as she and other volunteers clean up garbage and plant trees along the bank of the Maumee River east of the Anthony Blvd. bridge on Sunday as part of Save Maumee's Earth Day project. Chad Ryan | The Journal Gazette John Fabini, front, carries contaiers of mulch to put down around new tree plantings while Lynn Beers follows him to help volunteers as they plant trees and pick up garbage along the bank of the Maumee River east of the Anthony Blvd. bridge on Sunday as part of Save Maumee's Earth Day project. Chad Ryan | The Journal Gazette Hannah Drerer, cente,r carries a shovel as she and other volunteers plant trees and pick up garbage along the bank of the Maumee River east of the Anthony Blvd. bridge on Sunday as part of Save Maumee's Earth Day project. Past old brick warehouse buildings and a Huck Finn slide down the soil riverbank, able-bodied volunteers came Sunday with shovel and muscle to plant nearly 400 young trees. 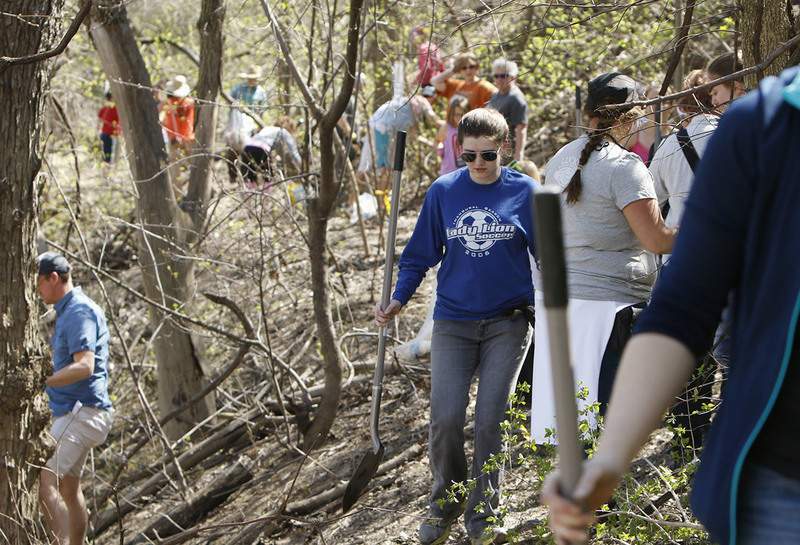 More than 250 people celebrated Earth Day by lending a hand in some way to hack away at the invasive Asian honeysuckle - easily spotted as the earliest green along the river - and to plant the 380 young trees along 1,000 linear feet of the Maumee River. 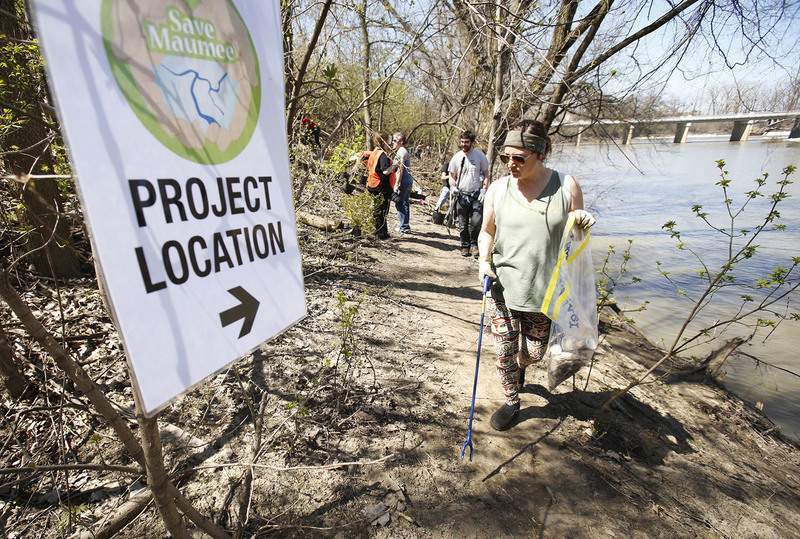 The Earth Day event, at Wayne Street where it meets Glasgow Avenue and the railroad tracks near Dwenger Avenue on the city's east side, was sponsored by Save Maumee Grassroots Organization. Money to buy the trees for this event and others this year and next came from a $50,000 federal grant from the U.S. Forest Service, said Lydia LaMont, Save Maumee's president. Down on the riverbank, Abigail King, vice president and founder of Save Maumee, worked planting trees and directed others. Volunteers hauled big buckets of water out of the muddy Maumee to water the young trees, besides the back-breaking work of digging. Species planted included oak, Ohio buckeye, hickory, sycamore, dogwood, spicebush and arrowwood. "This is how you protect the riverbank," King said, looking out at the river rolling by. "You give the water what it needs." Save Maumee's goal is to plant 1,390 trees this year. Adding about 400 trees trees Sunday will capture nearly 23,000 gallons of water each year that will reduce flooding elsewhere, according to information distributed at the event. The trees also reduce the sediment load to retain 190 tons of soil each year. Sediment makes the river brown, experts say, and represents the loss of wetlands. Volunteers came as a result of social media and enjoyed perfect skies and 70 degree weather to carry out their goal. Bruce Allen has been volunteering for years and has gone to Washington, D.C. with the Save Maumee organization to lobby Indiana lawmakers on environmental legislation. Sunday he was hauling tires he found in the river up the riverbank. "Kids used to think it was hilarious to roll them through the bridge," Allen said. The new bridge on South Anthony Boulevard doesn't allow that, he added. Allen also planted trees. Barb Clark, a board member for Trees Indiana, spent three hours down on the riverbank and had mud on her boots and clothes to prove it. Clark was going home, she said, to plant yet another tree in her rain garden and then kick back with a barbecue and a Pale Sierra Nevada beer. "She really means what she says," Clark said of Frost-King whom she met at IPFW. Of critical local importance is replacing the trees that have fallen victim to the emerald ash borer by planting a variety of trees, King said. "According to Plan-It Allen, Allen County's comprehensive plan, most of the forested corridor along rivers and streams has been removed in addition to 24 percent of our tree canopy that is scheduled for removal due to damage caused by the emerald ash borer," King further stated in a release. "Add all the concrete and rooftops and reduction of natural filtration devices like trees and you don't need to wonder why we have flooding problems." The honeysuckle plant spreads because birds eat the berries, Allen said. The berries are mostly water with little nutrients, causing the birds to eat them down. When the birds eliminate their own waste, the seed is spread.